I enjoy treating children and adults with ENT disorders, getting to know patients and their families. I enjoy performing surgery of the head and neck. It is gratifying to improve the quality of life of my patients and their families. I enjoy seeing young children and following them as they grow and mature. 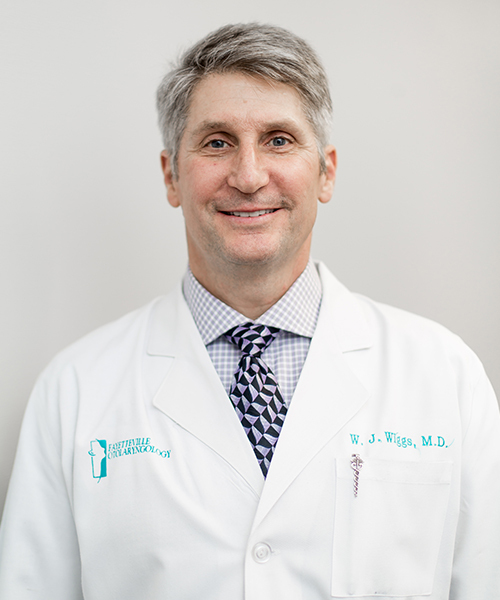 Dr. Wiggs is a Fayetteville native who earned his medical degree from East Carolina University in 1990. He completed his residency in otolaryngology at the Medical College of Virginia, Richmond, VA in 1995, and was board certified in 1996. Dr. Wiggs joined Fayetteville Otolaryngology in 1995. He maintains surgical privileges at Fayetteville Ambulatory Surgery Center, Cape Fear Valley Medical Center, and Highsmith-Rainey Hospital. Dr. Wiggs is married and has two children. His personal interests include church, family/children, hunting, fishing. physical fitness, golf and music.